Article first published as Book Review: ‘That Hidden Road’ by Rocco Versaci on Blogcritics. “That Hidden Road” is the memoir of author Rocco Versaci's cross-country biking trip as he takes the road less traveled across the United States, finding unexpected adventures and learning life lessons about himself as he goes. Along the way, he shares his personal experiences and findings in an intimate way with the reader, allowing full access to his thoughts and feelings, something authors are often reluctant to do. Versaci is an English professor at Palomar College and his command of the English language in the written form is clear from the first page. “That Hidden Road” also contains a few cartoons sprinkled intermittently throughout, which are fun and add brief distractions from the story. "That Hidden Road" reads more like a collection of blog posts or journal entries rather than a story. While it is nice that Versaci gives the reader an intimate look into his mind, his insights, while personal, may not be particularly valuable to the reader, at least not to this reader. The book reads very much like one event followed by another and then another, and while each event is well written, there is little connecting it to other events in the memoir. This makes the pace and flow feel wonky and at times confusing. Perhaps this is a stylistic choice, which in other books might work but in this story falls short. Ultimately, my biggest issue was that Versaci never really convinced me to care. 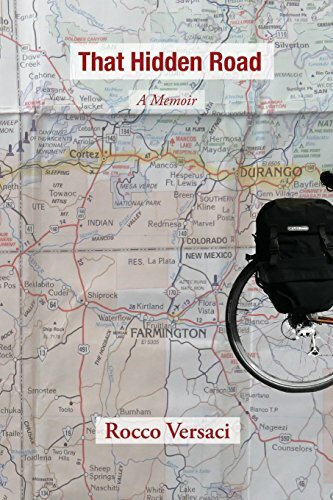 I mean, I might have followed his adventure on social media while it was happening, but to read a memoir about a guy I’ve never heard of before, whose claim to fame is biking across the United States is asking a lot. I just needed a deeper connection. Rocco Versaci is clearly a good writer, with a solid foundation and a mind for adventure. This book would have made an excellent blog and Versaci's accomplishments should not be understated; it is purely, in this case, they did not translate well into the memoir format. I give “That Hidden Road” three out of five stars. There was not enough to hold my interest throughout and I think this may ring true for others unless they have some sort of personal connection to the author. Those who know Versaci or travel in the same circles may find his story very interesting and his insights useful.